The fire behind the factory. 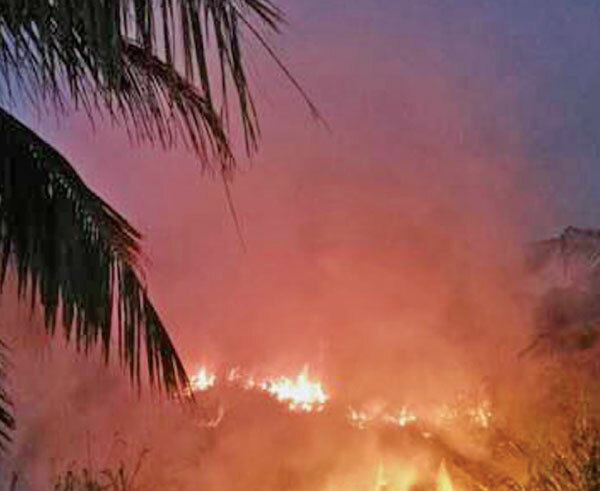 The Sri Lanka Navy assisted to douse a fire which broke out on a clump of cogon grass (iluk) at the back of a cement factory in Devata, Galle, on Sunday evening. Responding to the information of security officers that the blaze was spreading towards the cement factory, a fire-fighting team attached to SLNS Dakshina was promptly dispatched to the location. Accordingly, the Naval fire-fighting unit with seven firemen, a fire engine and a water bowser, assisted the factory workers who was taking precautions to block the fire with a trench. Navy firefighters followed all necessary action to contain the fire completely.